The new music video features notable female long boarders Carmen Shafer, Amanda Caloia, Amanda Powell, and Noelle Mulligan. Watch it below. The Getaway was produced by Danger Mouse and mixed by Nigel Godrich. Earlier this week, the band joined James Corden for ‘Carpool Karaoke’ on The Late Late Show. The clip was viewed online over six million times in 24 hours. Watch the clip HERE. Red Hot Chili Peppers' previous album, I'm With You, was released in 2011 and topped the charts in 18 countries. The Red Hot Chili Peppers will continue to perform at a variety of music festivals around the world this summer, including headlining Lollapalooza in Chicago on July 30th. For a complete list of upcoming dates, click HERE. 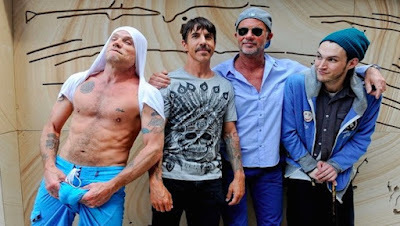 One of the most successful acts in rock history, Red Hot Chili Peppers, which is singer Anthony Kiedis, bassist Flea, drummer Chad Smith, and guitarist Josh Klinghoffer, have sold more than 60 million albums, including five multi-platinum LPs, and won six Grammy Awards, including "Best Rock Album" for Stadium Arcadium, "Best Rock Performance By a Duo or Group" for "Dani California," "Best Rock Song" for "Scar Tissue," and "Best Hard Rock Performance With Vocal" for "Give It Away." The band was inducted into the Rock and Roll Hall of Fame in April 2012. The Red Hot Chili Peppers' last studio album, I'm With You, was released by Warner Bros. Records on August 29, 2011.